Anyway, I have enough habits of my own, none of which will ever be in a book (unless it’s a book about highly peculiar people). One of those habits involves my choice of summer reading, which consists entirely of a winter’s worth of unread Vanity Fair magazines (burned ceremoniously at the end of the season in – you guessed it – The Bonfire of the Vanity Fairs) and cheap paperback novels. And I mean cheap. The ones I pick tend to look like they’ve been read a million times, left out in the rain at least twice and used, on occasion, to prop up a sagging cottage deck. Those are the kinds of books that can stand up to the rigours of hammock life or endure a trip to the swim raft with nothing but a ziplock bag between their battered pages and the Deep. I’ve also developed a habit of building our cottage menus around the theme of the book. There may not be a single highly effective person who does this, but we’ve had some pretty good cottage meals that we might not otherwise have tried (although, I don’t recommend very long books – the summer I read Paul Scott’s The Raj Quartet my family started to complain of curry fatigue. Novels set in medieval prisons are also a challenge). This summer’s first book is a Nazi spy thriller, which might have led to a season of schnitzel and wursts (or worse), except that the book is set in Argentina and that means barbecued – grass fed and pampas grown – beef. We’re a little short of pampas around here, but as luck would have it, I happen to have a freezer full of excellent grass-fed beef. Now, I’m just waiting for my mail-order gaucho outfit and I am all set. 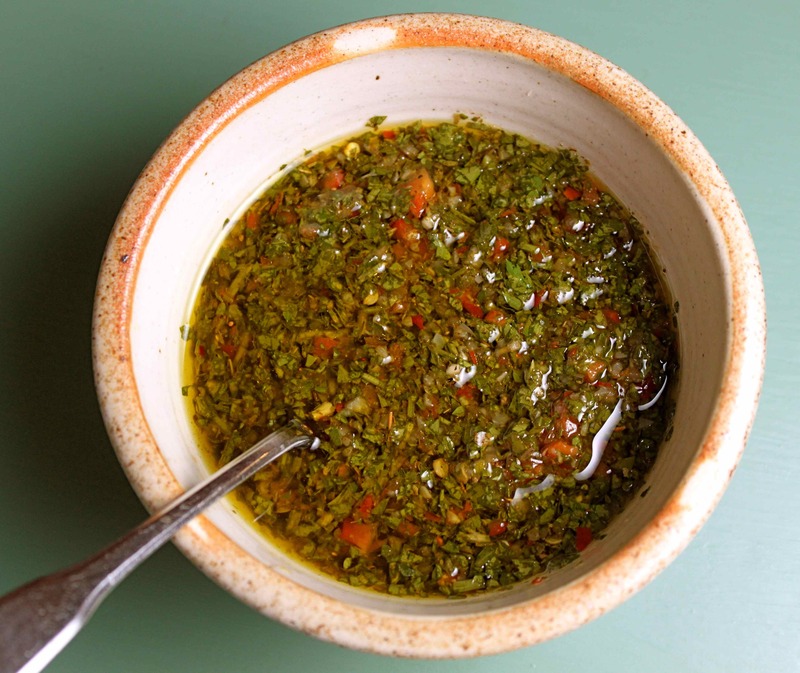 No table in Argentina would be ready for dinner (which people don’t even start thinking about until 9 pm, according to my novel) without a bowl of chimichurri, the tangy, spicy green sauce for which there are as many recipes as there are Argentinians. At its most basic it is made from flat-leaf parsley, garlic, red wine vinegar, oil and a little chili but feel free to experiment. Some people even add tomatoes to make a red version of the sauce. Here’s my version. Be careful, it can be habit forming. Place all ingredients except oil, salt and pepper in a food processor and pulse until fairly smooth, season with salt and pepper and taste. Transfer to a bowl and pour olive oil over top. Let stand at room temperature for at least 20 minutes but up to two hours. Stir and serve spooned over barbecued beef. 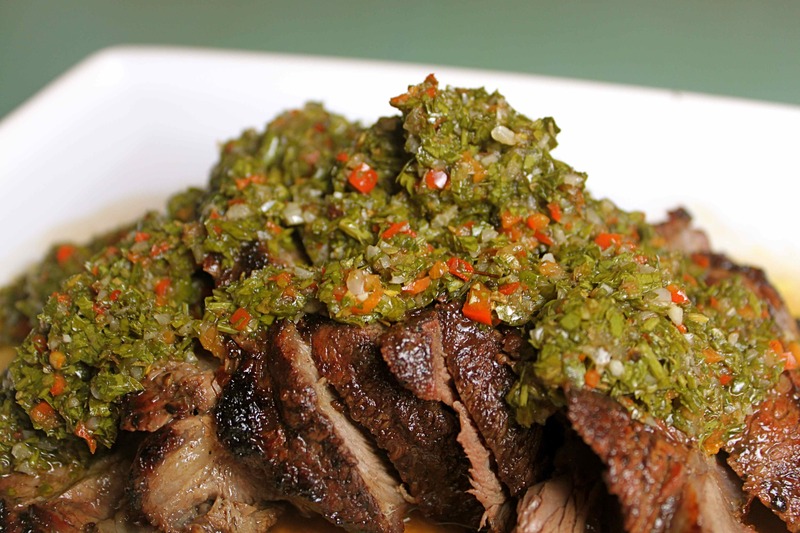 Note: leftover chimichurri sauce can be kept in the refrigerator for up to three days. It makes an excellent marinade for chicken. I like the idea of theming food around a book. Some are too easy. Under the Tuscan Sun. Larry’s Party. But I just re-read Pollyanna and no food is coming to mind. Lime cordial? Agreed; some books are tougher than others. Science fiction is pretty much out. I think my favourite summer – in terms of food – was the one when I read Gone with the Wind.